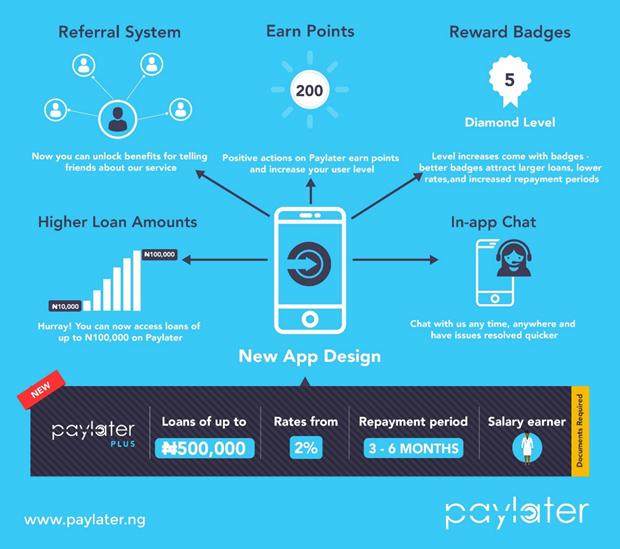 Paylater is a simple, entirely online lending platform where you can get quick loan in Nigeria of up to N500k. With Paylater, getting funds have never been easier. Whether you’re a student, business owner, salary earner, or just in between jobs and in need of funds. We can help meet any urgent cash needs you have. With The Paylater Ladder, we help you build your credit and progressively obtain larger loans with continued usage of our service. Build up your credit rating by being an awesome borrower! 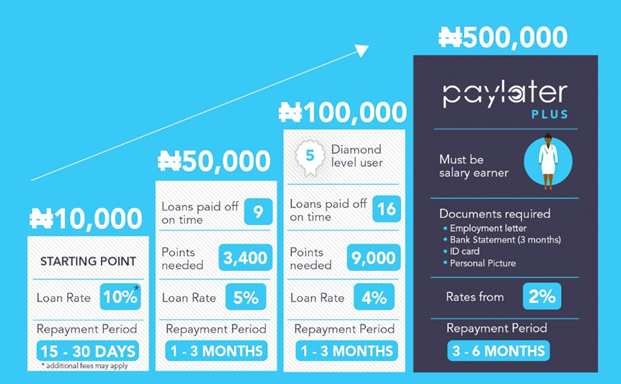 With a robust rewards system that increases your level as you display good borrower patterns — such as repaying loans on time and referring friends to the service — you can quickly rise up the ladder and be trusted for larger loans with longer repayment periods. You can also chat with our agents directly in the app to help resolve any questions or account issues that may come up. We’re always happy to be of assistance! 4. Submit your application. You will get a loan decision in seconds. 5. If approved, your account is credited within 30 minutes.